Marchionne plans to turn a 'middle-of-the-road' player in Europe into a global player. TURIN -- With his new five-year plan Sergio Marchionne aims to give Fiat S.p.A. and Chrysler Group the global reach and scale they need to prosper after the industry's worst crisis in 60 years. Many analysts believe the plan could work. Unveiling the strategy in Fiat's home city of Turin, Italy, Marchionne, who is CEO of both carmakers, outlined plans for Fiat and Chrysler to build 6 million vehicles a year, the magic number that Marchionne believes volume makers need to reach to survive in the global auto market. Fiat also will spin off its Iveco trucks and CNH tractors divisions to separate them from its core carmaking business in a move that most analysts see as a prelude to integrating Chrysler within Fiat and possible new alliances or partnerships with other automakers. Analysts said Marchionne's strategy is ambitious but were largely positive, although some are worried about Fiat's concentration of production in its Italian home market and whether the company can achieve its goals in emerging markets such as China and India where the automaker is weak. Banca IMI said that the de-merger will see Fiat spin off its less value-added and high-cash-burning automotive business from more profitable, cash-generating units such as CNH and Iveco. The bank said the creation of an automotive-listed entity could help the group to find new alliance opportunities with other players. It said the creation of a critical mass with Chrysler will better position the group to survive in the difficult automotive arena. Morgan Stanley analyst Adam Jonas said the de-merger ring-fences the historically cash-burning business from its cash-generating ones, serving as a sort of "firewall" from potential automotive liabilities. "Without Chrysler the de-merger would not be possible," Jonas wrote in a report. "Chrysler enables Fiat Auto to be of sufficient scale, growth, profitability and geographic balance to help Fiat Auto stand on its own. Herein lies one of the biggest buckets of value currently ignored by the market." Max Warburton, an auto analyst at Bernstein Research in London, was skeptical earlier this month that Chrysler can genuinely be turned around and he saw few product-led revival opportunities or synergies with Fiat Auto. After Marchionne detailed his plan, Warburton was still skeptical. He wrote: “We remain unconvinced that Chrysler can genuinely be turned around, see few product-led revival opportunities and remain unconvinced of synergies with Fiat Auto." Philippe Houchois, auto analyst at UBS in London, said rather than the 'quick fix' approach of spinning off a debt free Fiat Auto, Fiat has opted for a more responsible and longer term approach to creating value in its proposed demerger." He said a downsized Fiat S.p.A. with only its automotive business has two 'insurance policies' -- supercar brand Ferrari on valuation and its parts supplier Magneti-Marelli on liquidity as a sellable asset. Italian analysts expressed concern about Marchionne's plans to tackle Fiat's underutilized Italian factories by boosting production in Italy to 1.4 million from 650,000 units last year, mainly by adding new models and running most of its plants on an 18-shift workweek. Banca IMI said concentrating production in Italy will require a major effort to contain overhead and labor costs. Mediobanca said Marchionne spoke of a Plan B, which could involve plant closures that would create huge costs to pay off workers. It pointed out that General Motors Co.'s Opel unit is offering up to 144,000 euros to employees at its Antwerp, Belgium, plant that is scheduled to close at the end of the year. Banca IMI also said the success of Marchionne's expansion plans for China, India and Russia, where the automaker has a very poor track record, will be criticial. Fiat cannot afford to lose again in these markets, it said. • Produce 300,000 units a year in China by 2014 at a newly created joint venture with Guangzhou Automobile Industry Group Co., which already has partnerships in China with Toyota Motor Corp. and Honda Motor Co.
• Boost sales in India to 130,000 units in 2014 from 21,194 last year with its joint venture with Tata Motors Ltd.
• Boosting Fiat unit sales in Latin America to 1.12 million in 2014 from 799,000 units in 2009. The plan calls for Fiat to double is annual vehicle sales to 3.8 million by 2014 while Chrysler is expected to boost its sales to 2.8 million from 1.3 million in 2009, a total of 6.6 million, which reduces to 6 million when cross-supplied vehicles between the two automakers are omitted. 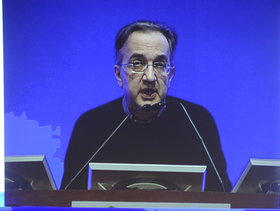 Marchionne said his strategy involves a fundamental transformation of an automaker that currently is an average, middle-of-the-road player in Europe with an inadequate manufacturing infrastructure and a so-so distribution strategy. "When you look at it and you are an absolutely rational human being, your instinctive reaction is to express some level of doubt about its achievability," the CEO said about the plan that took more than five hours to reveal. But he believes Fiat can become a truly competitive global player with Chrysler. Without the alliance with Chrysler, “Fiat Auto would have remained a marginal player for the rest of its life,” Marchionne said.